Poland has had lively Reformation Day celebrations this year. 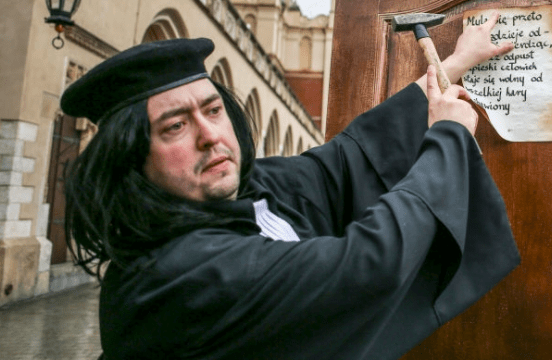 Here is a Polish man nailing the theses to a door in remembrance of Luther. There is no holiday more holy to the #StillProtesting Protestant than Reformation Day, except for perhaps Ressurection Day. In fact, it’s still a national holiday in several countries throughout the world, including Germany. Other nations have special declarations designated for the day, while not necessarily giving people a day off of work. Pulpit & Pen would like to encourage you to take part in Reformation Day celebration this season by nailing your confession of faith to your local Roman Catholic Church door. Yes. You read that right. Luther was touching on nothing new in his labeling of the Pope as Anti-Christ. Many throughout history made this claim, beginning with (at the very least) the year 991. The Westminister (25.6) and London Baptist Confession (26.4) label the Pope as Anti-Christ. Calvin identified the Pope as the AntiChrist (Book IV of “Of the Popish Mass). Spurgeon identified the Pope as the Antichrist (The Sword and the Trowel eg. Jan 1866, Aug 1868). Essentially, Protestants believe the Pope is either the – or at the least – an antichrist. Calling oneself “Holy Father” is anti-God. Calling oneself “the head of the church” is anti-Christ. Calling oneself the “Vicar of Christ” is anti-Holy Spirit. He’s more than the antichrist. He is the anti-Trinity. Whether or not you agree that he’s the eschatological anti-Christ, he certainly is of the spirit that is anti-Jesus. 1. To be fair, the church door in 16th Century Germany was like a bulletin board. At least, that’s the theory. There is a question of historicity regarding exactly how acceptable it was to nail the theses to the door in this way, but modern thought absolves Luther of aggressive zealotry by arguing that it was pretty normal to place public treatises and notices on doors. 2. Also to be fair, there’s a legitimate question as to whether or not it was a “nail” that Luther used to affix his treatise and might have been – in fact – glue (although this is a less-common theory). Others postulate that it never happened because the first time Luther mentioned it (through his publisher) was in 1544. So, why do this? It’s for two primary reasons. First, the majority of Protestants deny Justification by Faith Alone. In short, Protestants are becoming (for lack of a better way to put it) Roman Catholic in their soteriology. Protestants need to know why Protestanism is “a thing” and why it exists in the first place. They need to be aware of the debate, and search the Scripture to understand the controversy. Secondly, most Roman Catholics have never been told that Protestants have never historically considered them not to be Christians. We must express our grave concern for their eternal salvation. They don’t know that their own church has called us anathema (and the Council of Trent still stands as dogmatic, infallible teaching), and that it’s mutual. We must exhort them to flee idolatry. Yes, we recognize this is incendiary. We recognize it is radical. We recognize that it is provocative. Well…it’s a protest. What did you expect, exactly? So then, a few suggestions. First, feel free to tack it to the Roman Catholic church bulletin board. It fulfills the spirit of Luther, but might not be nearly as gratifying. Secondly, use a small finishing nail or a tack if you choose to put it in the door. Try not to “damage” property by any meaningful definition of the term, “damage.” Place it near the crease of the door or in the grain, so that the tiny hole is not noticeable once removed. Third, don’t feel obligated to nail the 95 Theses. Choose your own Confession of Faith (hopefully you have one). Fourth, don’t do it anonymously. Put your name on it, as Luther did. Also, provide a short note about why you are doing this. You can use our example STILL PROTESTING. You will see that it’s quite polite. Fifth, be prepared to be charged with a misdemeanor for “vandalism,” even though removing such a small tack would leave a nearly unnoticeable hole. In fact, you might be charged with a hate-crime (some states have laws that give added “protection” to houses of worship and government buildings). Note: Being charged with something does not mean you are guilty of it. In particularly Roman Catholic communities, it may take very little to be charged with vandalism. People are offended pretty easily these days. Furthermore, please understand that you are not “trespassing” on property generally opened to the public…unless you are asked to leave. If you are asked to leave, leave immediately and leave quietly. **Special Note** Do not, even if you have a concealed carry permit, get anywhere close to the location with anything that could be classified as a “weapon” (as opposed to a hammer, which is a tool). Don’t even take a weapon on the property or parking lot. Do not argue with anyone with a hammer in your hand. Come back later and pass out tracts or preach, without a hammer. Sixth, include the Gospel in what you tack, nail or post. If not, what’s the point? The point is to point out their grave errors, call them to repentance, and give them the Good News (which they will not hear inside the building). Leave some tracts (there’s an excellent one here – hopefully it’s back in stock soon) or highlight the portion of your Confession dealing with salvation. We pray that thousands across the country will take part in this Reformation Day season with a form of protest. The Protestant Reformation is not over, and never will be until Christ returns.